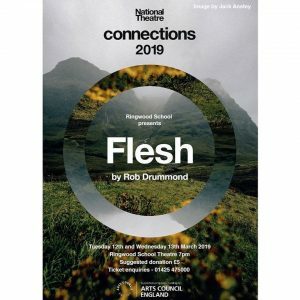 Ringwood School’s drama department has been working in partnership with The National Theatre and Chichester Festival Theatre to present a brand new play called ‘Flesh’ written by Rob Drummond as part of the National Theatre Connections Programme. With their help and guidance, Ringwood School’s cast and crew gave it their all and delivered a confident and engaging performance at the Alexandra Theatre in Bognor Regis on Friday 5 April. Ringwood School Arts Foundation, Parsonage Barn Lane, Ringwood, Hampshire BH24 1SE.